So KM, even in her own terms, should have said “Plus 8 to plus 5” and not “Minus 8 to plus 5”. In her units, that’s not a benefit of +13 from independence but a disbenefit of -3. 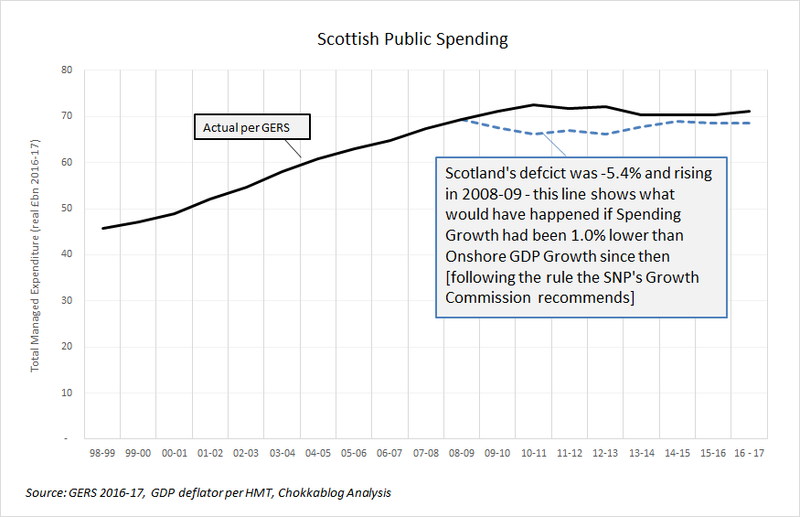 I believe the Kate Forbes 8.5% figure is plucked from the draft 17/18 budget on page numbered 4 and represents a predicted real terms change 10/11 to 18/19 (from the cherry picked 10/11 baseline, not an 07/08 baseline). The projected 1.1% budget cut in real terms 17/18 to 18/19 within the KF 8.5% figure in the draft budget did not materialise in the 18/19 actual budget.